“Walking… is how the body measures itself against the Earth”. Although I have a strong background in Science, since I have started practicing Yoga I have been looking for a more integrated and holistic approach to education, a way that does not separate body from head, feeling from thinking, man from Nature, or Art from Science. I found what I was looking for at Schumacher College in England. 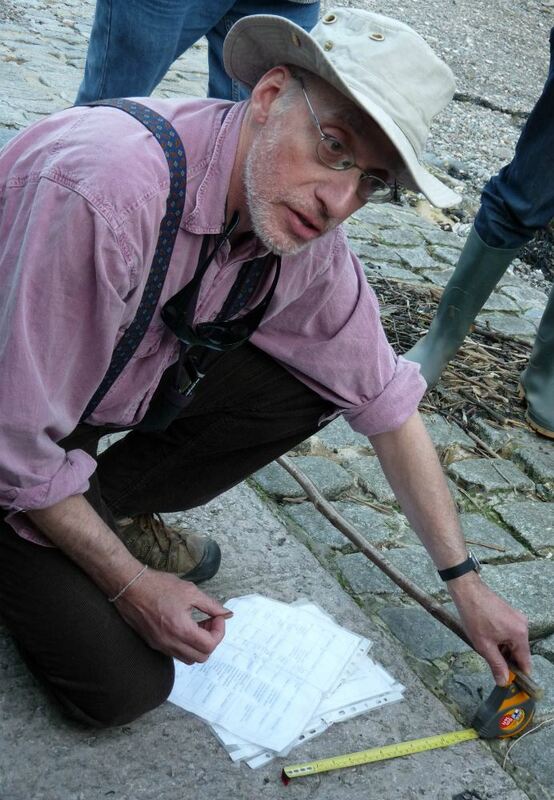 It was there that I came across the Deep Time Walk (DTW), one of the best educational resources I have seen so far. I have been using it since returning to Brazil in 2014. The DTW is a powerful tool to inspire us to learn profound scientific concepts through the simple act of walking. At the same time, it is a methodology that makes use of the Four Ways of Knowing as proposed by Jung: sensation, feeling, intuition and thinking. It is a teaching practice that has contemplation as a key element to support learning and the building of ecological awareness. What Is The Deep Time Walk (DTW)? Since we are able to perceive life on a human time scale, ‘the clock time’, when walking the 4,600 meters we can grasp the meaning of 4,600,000,000 years, the age of our home, and put its history, which is our history, into perspective. 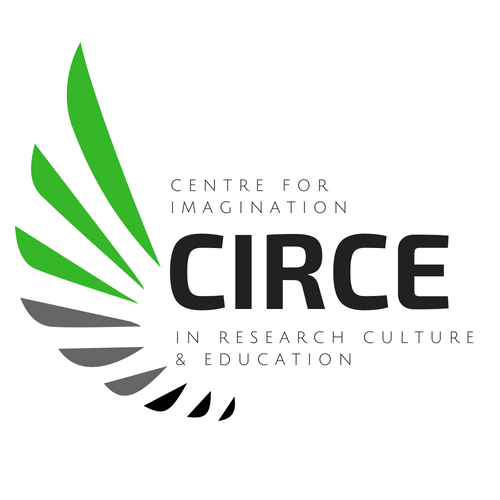 This Walking Curriculum activity allows us to experience the Earth and Time with new eyes; it makes easy for everyone to understand the idea of an ‘atomic reincarnation’ as presented in the first chapter of Cosmos – A Spacetime Odyssey (the scientific documentary from 2014 that continued the story of the famous Cosmos that was presented by Carl Sagan in 1980), and realize that “we are Nature itself, we are the Earth” even though we might not know much Chemistry or the main cycles that happen in life. In terms of academic curriculum we can easily see the DTW as an interdisciplinary activity that allows us to go as deep as we want to in different areas: we can use it to unveil many aspects of life evolution. For instance, we teach that life is much more dependent on collaboration than competition and that diversity is an essential aspect of life, or that different human species existed all together before Homo Sapiens became the only species to thrive. We can highlight lots of Chemistry concepts, like the Carbon cycle, or photosynthesis, or how we even got O­­2 in the atmosphere in the first place. Or we can focus on Geography and point out the soil formation on the path we choose. Because of my background in Chemistry I always take a little more time talking about key interesting facts related to that, even though my real main concern is trying to call the participants’ attention to the beauty of life itself and to the many meanings of time. The DTW can help us regenerate our relationship with time and with life. It can help us to come to the understanding that there is no separation between us and Nature, that actually the Earth is our own flesh, our bigger body; it can help us to “identify our story with the story of the Earth,” as the writer David Abram says in the video below. At the same time, it helps us to regenerate our connection with teaching and learning. 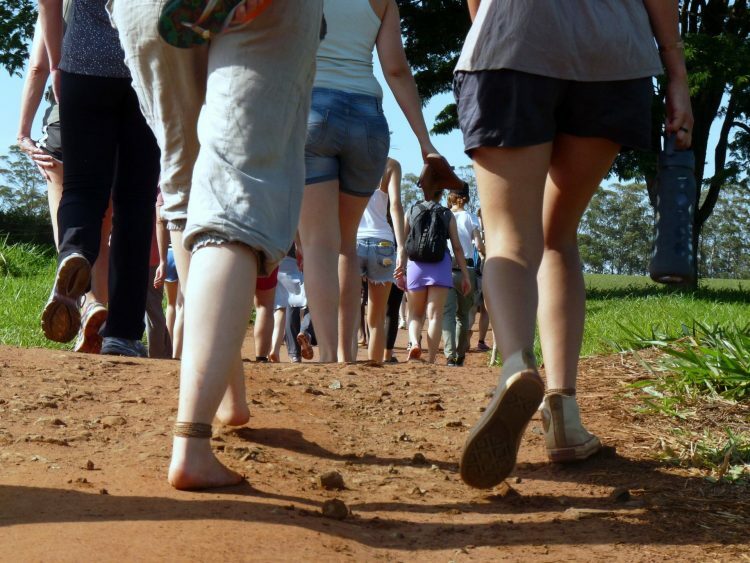 I have done this walk with many different groups: teenagers, children, and adults – they all love it. One very interesting experience I had was with a group of teachers from different disciplines: they all could relate it to their own subjects and how useful it would be to have the chance to use it as an interdisciplinary activity. Another time I had a group of teenagers, children, parents and teachers. The parents were amazed to see their kids interacting with me, helping me to explain all the things they had already learned, and teachers were proud to see that their students knew what they had taught. One of my most powerful walks happened in 2015 when we had a great drought here in São Paulo area. I conducted the DTW around a dam at its lowest water level. We were literally walking on a path that would have been impossible to walk on at other times. We stepped on the cracked soil and could even see abandoned piers. We could see and feel with our whole body the effects of climate change, of the Amazon deforestation, and of what we call development. 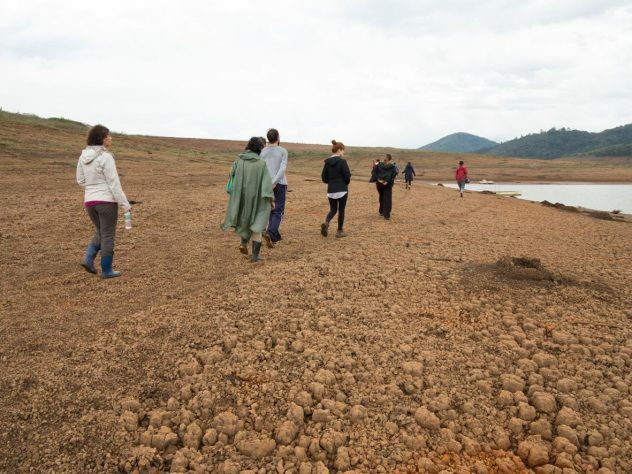 Walking where before there was water! Another very powerful DTW happened for me last June in Rio de Janeiro. 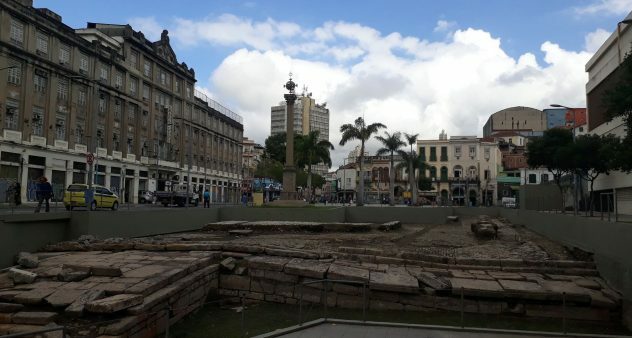 The DTW took place in partnership with the Museu do Amanhã (Museum of Tomorrow) to celebrate the indication of the Valongo Wharf Archaeological Site as a World Heritage by UNESCO. The Valongo Wharf was the largest arrival point of slaves in Brazil, a very sad part of our history. The idea in this DTW was to draw a parallel between our African ancestry as humans and as Brazilians, and rescue and honor part of our history, however sad it may be. To have History teachers working together with me was a key factor to the success of these walks. And because I truly believe Education should be about the regeneration of relationships, in such complex times as we are living in, I am sure that the experience with the Deep Time Walk, an experience with body, mind and soul, can help us regenerate our capacity to feel a sense of awe for Life and for our Earth whilst understanding the beautiful side of Science. The DTW offers us an experience that help us to grasp a little bit of our story, to realize the miracle that is Life. It can help us to move towards a more beautiful world. There is a Deep Time Walk app, an audio book for smartphones developed so more people can experience this walk on their own. This app can help you to design your own walk so you can use it with your students. Do the walk a few times on your own before facilitating one with a group. Watch Cosmos – A Space Odyssey, especially the first episode, where some of the key moments are presented and the Cosmic Calendar, created by Carl Sagan, and its relation to the DTW is explained. Until you have walked about 4 km, make stops every 500 meters to point out only the key moments of our story. Then, during the final 600 m you will have to stop every 100 meters or less. Always have a measuring tape with you. Before starting walking show the group how long one meter is (remember, 1 m = 1 million years on the scale we use here). Then, at the last 30 cm show it again – everything that you learn at school about our history happens on the last few millimeters! Try to introduce some body exercises before the walk to prepare it for the exercise. During the walk, you can stop and have a relaxation or a mindfulness exercise. That might help the participants to have a more profound experience. Invite them to walk in silence as much as possible so they can meditate on the meaning of each step being almost half million years. What are the sounds we can hear? What are the things that catch your attention? Could you guess the color of the sky when there was no oxygen in the atmosphere? These are just a few questions you can use with your group. After choosing the place, many more should come to you. When doing it with young children, invite them to help you tell this story; they will love to tell all they know about bacteria, fungi, and dinosaurs. And if you want more tips, write to me at denicuri@gmail.com. I will gladly give you more tips about it. Call the attention of the group to the fact that Life is a cognitive and complex process, which is based on diversity and cooperation instead of on monoculture and competition, as our Western culture likes to promote. 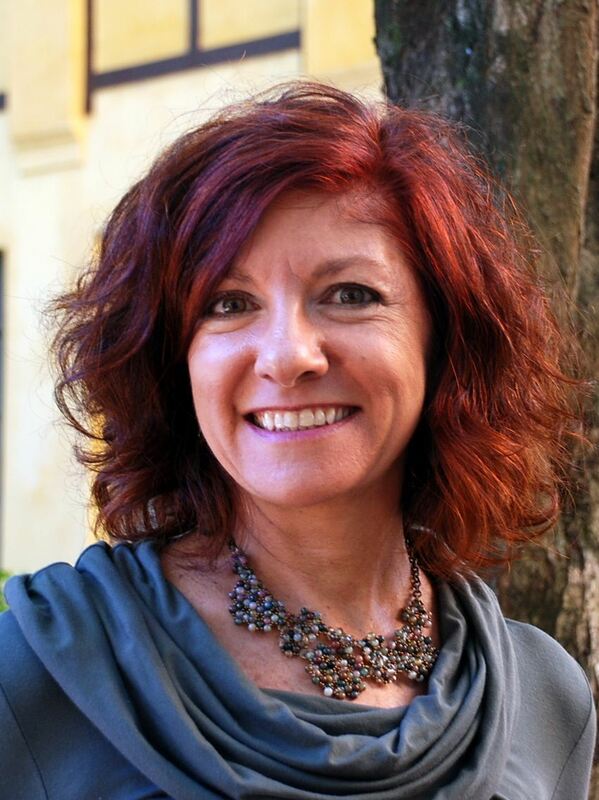 Denise Curi is an educator and a consultant, who seeks to inspire and to provoke reflections that generate changes on how we see and act in the world. The projects she is involved with, such as the Deep Time Walk, seek to “break the numbness” in which we find ourselves to rescue our enchantment for life. She holds a PhD in Science and a certificate in Pedagogy of Cooperation, went to Harvard for a postdoc, taught Chemistry for 13 years, and then went to Schumacher College (England) and to the Sustainability Institute (South Africa) for a sabbatical, as a volunteer. Get in touch with her at denicuri@gmail.com or find her on Facebook.